We need to get ready for spring drills. Of course, that is not to assume that you are not already hungry for some football related news. But being prepared is a different issue altogether. Having been dormant in terms of Georgia football the last several weeks will do that to you. That brief taste of football and influx of gridiron news and info that comes as a bridge between winter and spring. My calendar says practices start next Tuesday, March 20th. Here's what is on my mind. Bobo. He takes so much blame (who me? ), truthfully more than he deserves when it comes to offensive production. I believe he has yet to get everything he needs from his unit. However that's the bottom line that ultimately falls on his shoulders. Looking back he was handicapped some last season by a patchwork tailback position and an offensive line that struggled with consistency. Can Coach Bobo pull everything together this season? Crowell. If this kid can turn a corner in the figurative sense as fast as he can turn one on the field, he may go the furthest towards solving a lot of issues offensively. We were a different team when he as healthy and on the field. 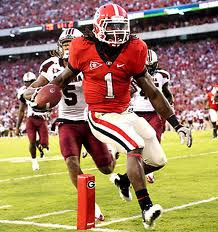 Bobo's offense can flourish with an effective, explosive ball carrier like #1. Grantham. He's the one being praised and getting the extension this off season. His defense made huge strides from year 1 to year 2. A lot of that had to do with personnel changes and general understanding of the base scheme. But the truth is for all the hussle and pressure I remember from 2011, I also remember not being able to stop LSU in the 2nd half and letting the Spartans score late to force overtime. I wonder how much those last two games have bothered Todd Damn Grantham the last couple months. Specialized changes. We graduated Walsh, Butler and Bogatay. The coaching staff is consulting with professionals on special teams. G-day won't give us much of a look of course, but I am anxious to hear the chatter this off season in terms of how things are being addressed. Afterall, if Drew Butler were like 99.7% of the punters in the history of punters making tackles...we lose to Vandy. And then, who knows where we are today. Strong...but conditioned? Last year we were definitely a stronger, better looking team. However we still fell off late in games. With the re-introduction of mat drills this winter, will we become a better conditioned team. And perhaps more importantly, will we be more flexible and avoid some nagging injuries. I wonder how much of that fall off in the second half was due to the lack of depth on the O line. The starting O line played nearly every snap against the Hillbillies and seemed to blow up with penalties when we were about to take control. They sure played lights out against Auburn, yet were so flat against Kentucky. We didn't score a td until the 4th quarter. I thought the Kentucky passing game was pretty successful against us . With a D that will be even stronger and if Bobo gets a little help with the consistency issues it will be a lot of fun in 2012. If Grantham's defense grows by the same leaps and bounds in year 3 as it did in year 2...watch out! O-Line, Murray, red zone defense, defensive scoring vs. ranked teams, tight end, db's, just a few concerns. Lucky, South Carolina is only ranked team on the schedule, EASY 10 win season. Bobo actually did a solid job scoring with the offense. Averaged 27 points a game vs. ranked teams. Grantham struggled vs. ranked teams at 38 points per game. I'd like to see Grantham down to 15 a game against ranked teams. Grantham's defense was good against teams like Coastal Carolina, but like Bernie said, struggled against ranked teams. In fact, finished 11th in SEC vs. ranked teams in scoring, allowed almost 40 points per game. Hopefully year 2 to year 3 will see this drop from 39 a game, to 15 a game. Grantham's D really STRUGGLED IN RED ZONE DEFENSE. 116th in red zone conversion rate, 88th in red zone td %, his D allowed 21 td's in just 32 red zone attempts.